“As we listen to this teaching, it is important to restrengthen our motivation of bodhichitta, joy, and appreciation, and together with that, our purity understanding of the absolute true nature. With this motivation, we will briefly discuss Garland of Views: A Collection of Esoteric Instructions (Tib. man ngag lta ba’i ’phreng ba),which was given by the great teacher Guru Padmasambhava, and is one of the most renowned works of philosophy in Buddhism. In this teaching, Guru Padmasambhava used the metaphor of a garland to represent the wide range of possible views that we can have. What is the purpose of studying and knowing all these views? When we practice, three very connected elements are always present: view, meditation, and conduct. Among these three, our view is the most important. If our view is wrong, then our meditation and conduct will be wrong, and they will not go in the right direction. Therefore, knowing the perfect view is crucial. Try to strongly activate that view and meditate on it. Then, based on that view and meditation, good actions and conduct will naturally follow. As Guru Padmasambhava stated in this teaching, we can summarize the vast number of possible views into two groups: (1) the worldly views of samsara and (2) the nonworldly, or Buddhist views. The worldly views are associated with the ways most of us think, believe, and act. They are known as “worldly” because they are always connected with some form of grasping or clinging. According to the Guhyagarbha Tantra, these four worldly views can be considered in two groups: the first two are far from the true nature, while the second two are much closer to the true nature, although they are still mistaken views of ignorance. The first worldly view, the flat or blank view, is far from the true nature. With this view, you generally do not think about anything; you are entirely unreflective. You do not consider anything about form, foundation, or the process of cause and effect. You do not think about the past or the future, or even much about the present. You do not believe in virtues or nonvirtues. You simply are the way you are, without ideas or thoughts, enjoying this life, or struggling against it, with no real means of advancing yourself further. Because you have no ideas, you do not think that such things are of any importance. This is the basic character of the flat or blank view, although we should recognize that within this category there actually are many individual variations in views and ways of thinking. The second group of worldly views, the rejecting view, or throwing-far-away view, is that of the materialist or hedonist. If you hold a view that falls into this group, you generally do not want to investigate or analyze too much, choosing instead to simply accept what you believe or have heard, giving complete power to “the authorities” for your knowledge and understanding. You do not believe that you can see anything beyond what the naked eye reveals; therefore, anything that you do not see, hear, feel, or sense, you reject or throw away as though it doesn’t exist. For example, you think that only this present life exists—there is no past and no future. Only this life matters. You do not think about whether there is a life before or after this one, and you therefore do not consider the past or future lives of yourself or others. You simply want to be rich and powerful in this life, and there is nothing more to consider than that. You reject or throw everything else far away. The third view, the dead-end view, is closer to the true nature, although it is still a view of ignorance. This is the view of the nihilist. If you hold this view, you want to go far beyond to a deeper level, but you are stuck where you are. You believe nothing beyond what you can see for yourself. You investigate and analyze things, but when you do not find something, you say it doesn’t exist. For example, you do not believe very deeply in the past or the future, or in all the different types of causes, conditions, and results. You will challenge others to prove that there is a life after this one. You have no confidence in the virtues described in spiritual teachings because you have not seen good results from doing good things or bad results from doing bad things. You believe there are no reasons for things like the sun coming up because these things just happen naturally by themselves. Similarly, you would say that we are here in the same way, without reason or cause. There is nothing more than that. The fourth classification of worldly views, the hanging-up view, is also closer to the true nature, but it falls short as well. This is the view of the eternalist. If you hold this view, you make exaggerated or extreme claims and hold onto them. You analyze and investigate all kinds of systems, but then fabricate something that you claim is there, such as the existence of a permanent ego or soul, or a principle force that has created everything. In addition, according to this view, things such as permanence, permanent existence, and causes and results are not really connected together. For example, the permanent ego or “I” has no cause, which implies that even though there is no cause, there can be a result, and that result is permanent. It is even believed that there can be a cause without a result. Although individuals holding this view are looking beyond the present to the past and future, and beyond where the five senses can go, they nominate the idea that suits their own beliefs or philosophy and then grasp onto it, even in the absence of logic or proof. 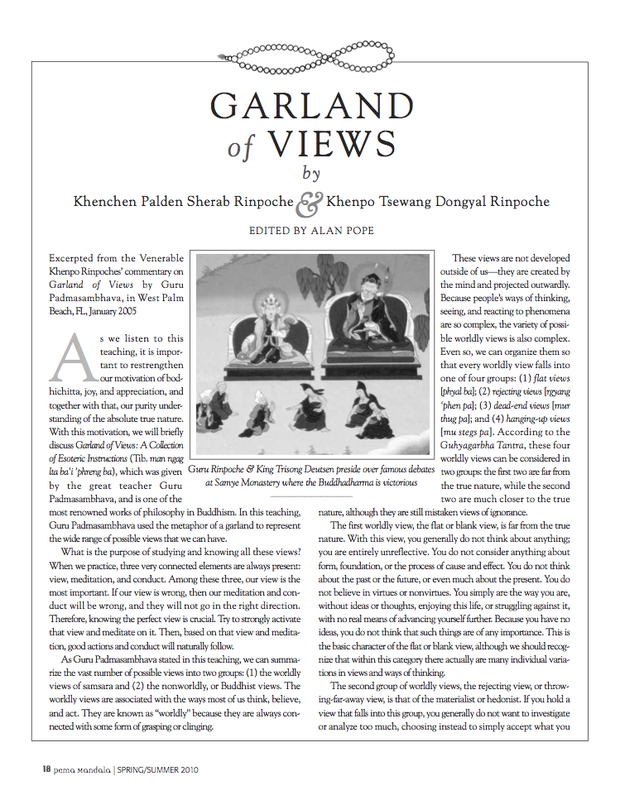 The nonworldly or Buddhist views are divided into two categories: (1) the views of the causal Sutrayana, which are the beginning or foundation of the Buddha’s teachings; and (2) the views of the Tantrayana or Vajrayana, the advanced teachings that are the most direct, detailed, and complete teachings. Either way, the teachings of the Buddha are liberative and lead practitioners beyond the world of samsara. The Sutrayana is called the “Causal Yana” because in this practice you mainly focus on the causes and conditions required to produce a good result. Even though you may look forward to having a good result, it won’t come to fruition if you do not establish good causes and conditions. 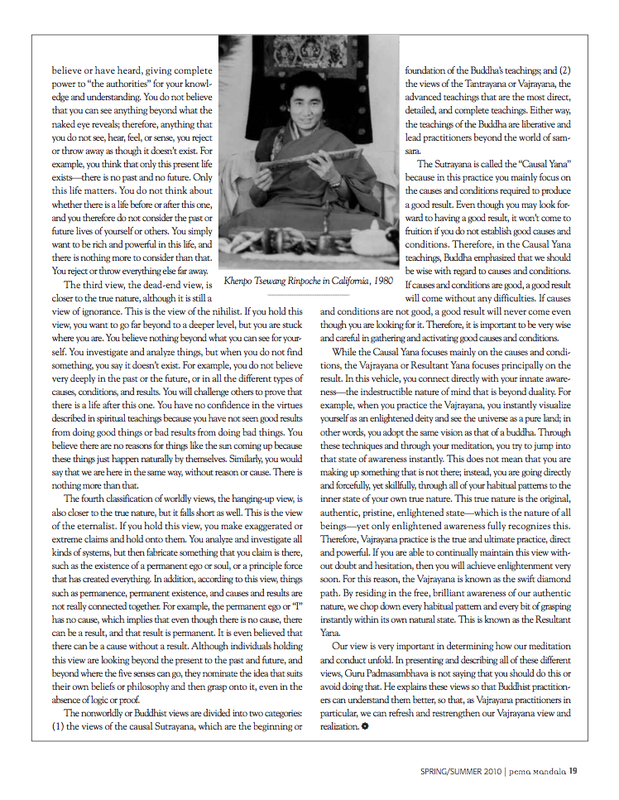 Therefore, in the Causal Yana teachings, Buddha emphasized that we should be wise with regard to causes and conditions. If causes and conditions are good, a good result will come without any difficulties. If causes and conditions are not good, a good result will never come even though you are looking for it. Therefore, it is important to be very wise and careful in gathering and activating good causes and conditions. While the Causal Yana focuses mainly on the causes and conditions, the Vajrayana or Resultant Yana focuses principally on the result. In this vehicle, you connect directly with your innate awareness—the indestructible nature of mind that is beyond duality. For example, when you practice the Vajrayana, you instantly visualize yourself as an enlightened deity and see the universe as a pure land; in other words, you adopt the same vision as that of a buddha. Through these techniques and through your meditation, you try to jump into that state of awareness instantly. This does not mean that you are making up something that is not there; instead, you are going directly and forcefully, yet skillfully, through all of your habitual patterns to the inner state of your own true nature. This true nature is the original, authentic, pristine, enlightened state—which is the nature of all beings—yet only enlightened awareness fully recognizes this. Therefore, Vajrayana practice is the true and ultimate practice, direct and powerful. If you are able to continually maintain this view without doubt and hesitation, then you will achieve enlightenment very soon. For this reason, the Vajrayana is known as the swift diamond path. By residing in the free, brilliant awareness of our authentic nature, we chop down every habitual pattern and every bit of grasping instantly within its own natural state. This is known as the Resultant Yana. 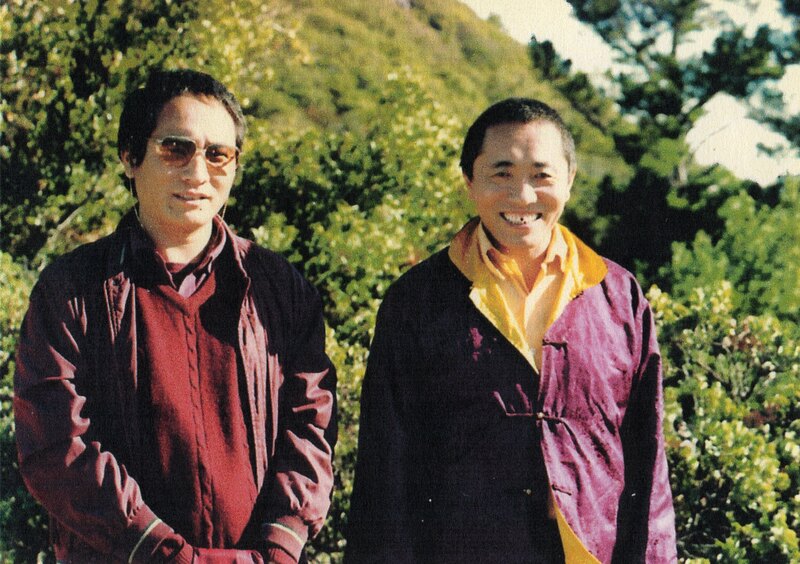 Photo of the Venerable Khenpo Rinpoches in Oregon in the 1980s.